A number of people write to me asking about the field of ornithology, from young grade-schoolers to retired businesspeople. Their interest in birds leads them to think they want to pursue the field of ornithology in some way. So let’s talk about that. What do ornithologists do? Well, an ornithologist studies birds, but there is no definite job description as many ornithologists do not work exclusively with birds. They may be ecologists, geneticists, wildlife biologists, land managers, teachers, researchers, outdoor educators, writers, artists, or tour leaders. They may work for federal or state government agencies, non-profit organizations, for-profit companies, or free-lance. They may exclusively with birds or only as a small part of their job. Ornithologists may work in the field, in the laboratory, or on data on their computer. They may specialize in a particular bird group or be a generalist. Many students want to know the salary of an ornithologist. Well, I’ve met many volunteers, but most salaried folks have moderate salaries. It depends on their job title, position, and level of formal education. I am often asked what tools an ornithologist uses. In the field – binoculars, telescopes, nets or traps, bands, measuring and weighing equipment, notebooks, stakes, markers, surveying equipment, geographical positioning system instruments, etc. Indoors – microscopes, chemicals, test tubes, syringes, slides, vials, cages, computers, electronics, etc. Some ornithologists use lots of tools, some very few. Depends simply on what we are doing. And what is a typical day? It depends. I teach, talk to students and colleagues, go to meetings, read books and articles, answer e-mail, work on my website, go out in the field to collect research data on birds which I then analyze with statistics in my office . I might write a grant proposal in order to generate funding for a project. Then I might be able to write a research paper for a journal if the research was good enough. I may give bird walks or talks to the general public and occasionally I do a wildlife assessment for some environmental project. I serve on a bunch of wildlife or environmentally oriented committees and speak to various groups about birds. To be accurate, I used to do all of those things before I retired. But I still give talks and lead walks, keep up my website, write this blog, chair the Chico Science Fair Board, and write books and articles. 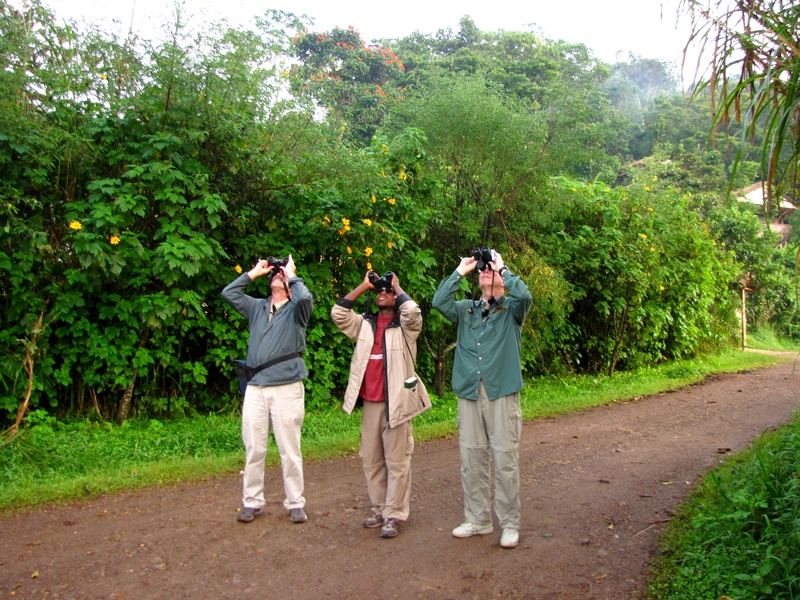 Ornithology is one of the few scientific fields that receives significant input from non-scientist amateurs. Good birdwatchers can add to the pool of data that ornithologists need. See Cornell’s Project Feeder Watch and the Audubon Society’s Christmas Bird Count . Do I recommend ornithology as a career? The advice I would give to anyone pursuing a career or change in careers is to pursue one that you will enjoy because you will spend a lot of time at it, whether it is ornithology or anything else. For more information on ornithological careers, see www.ornithology.com/careers.html. For anyone in any science-related field, I recommend taking as many math and English courses as you can. Math develops a logical mind and English helps you to effectively communicate. You are welcome to contact me about ornithology careers or any question about wild birds at rlederer@csuchico.edu .